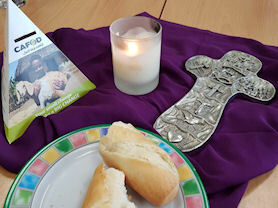 Staff and children in Year 5 and 6 were asked by our pupil Chaplaincy team to take part in the Cafod Family Fast day. 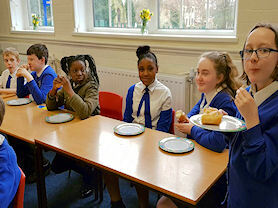 Our Pupil Chaplaincy team though it would be a good idea for children to understand how others live and gain a true understanding of what it means to fast and give up during this Lenten season. We had a great number of children who chose to take part and embrace this fully; showing an appreciation of their Catholic faith and an understanding of the season we are in. 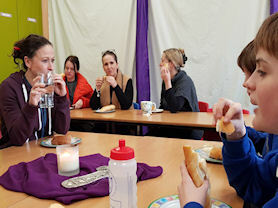 Pupils and staff fasted on bread and water for lunch and ate together; showing solidarity in a reverent room provided for them. It was remarkable to see so many taking part and hearing the discussions of the children who had decided to give up and donate money to Cafod's appeal. We are extremely proud of all those who took part in this event, both in our school and in our wider communities. "It made me think about how hard it was for Jesus to fast in the desert for 40 days." "The atmosphere was nice with the music. It made me think of how many things we have because we can, not because we need. So sometimes we need to stop and think before we take." 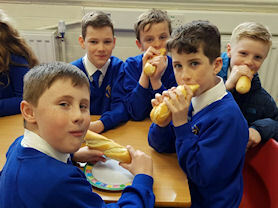 "It made me feel thankful for all of the things I take for granted, it was lovely to sit with the children as we shared our bread." "It made me feel good, I knew that some people have to deal with this in their lives every day and I was doing it to help them."